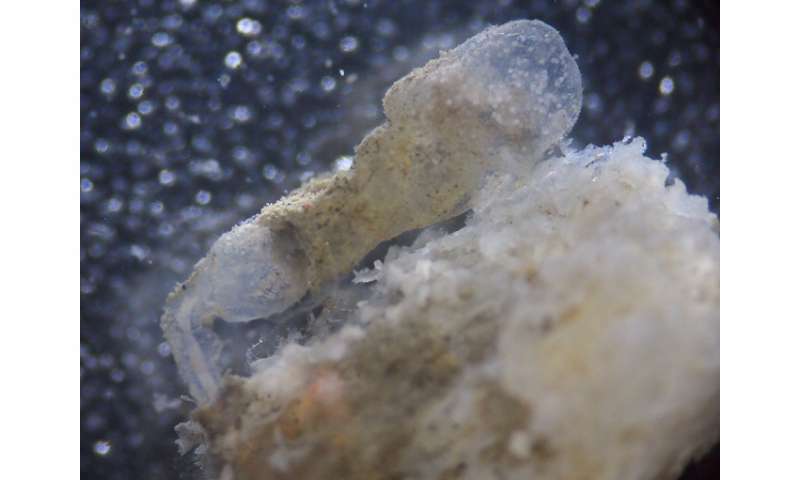 A female Osedax deceptionensis tube. Due to the transparency at the base of the tube one can see the palps of the female and in the most distal part are eggs held within the tube. A team of researchers coordinated by the University of Barcelona has found, for the first time ever in the Mediterranean Sea, a new species of Osedax, a genus of bone-eating worm that up until now had only be seen in colder and deeper waters. The study, published in the journal PLOS ONE, was led by Sergi Taboada, Ana Riesgo, Maria Bas, Miguel A. Arnedo and Conxita Àvila, researchers from the Department of Animal Biology and the UB's Institute for Research on Biodiversity (IRBio), as well as Javier Cristobo (Spanish Institute of Oceanography), and Greg Rouse (Scripps Institution of Oceanography, United States), one of the world experts in the study of these organisms. The article also expands on the phylogenetics, morphology, and ultrastructure of Osedax deceptionensis, another Osedax species that was discovered by the same research group in 2013 at Deception Island in the South Shetland archipelago (Antarctica). Osedax, commonly known as bone-eating worms, are marine annelid worms that are an important example of evolutionary adaptation to a specialised habitat: the bones of vertebrates sunk in the sea. The specimen discovered in the waters off Blanes (Spain) is the first to be found in the Mediterranean as up until now they had only been seen in the Pacific, North Atlantic, and Antarctic Oceans. As Sergi Taboada explains, "the fact that we have found Osedax for the first time ever in the Mediterranean proves that these organisms can also live in temperate latitudes in relatively shallow depths even though they are usually related with deeper waters. "The water temperature where Osedax is usually found is low, between -1 and 15 ºC, while in the Mediterranean, at shallow depths, the water is between 11.8 and 22.2 ºC. "The rapid decomposition of the lipids in bones found in warmer waters could explain the absence of Osedax in the Mediterranean at depths of less than 50 metres," says the UB researcher Conxita Àvila. However, in Antarctica, because the temperature is very homogenous throughout the water column, Osedax are also found in shallow waters. "When the carcass of a vertebrate reaches the Mediterranean seabed and remains at shallow depths, it is free-living bacteria that degrade its bones and decompose the organic material. Where it is deeper there are fewer of these bacteria due to lower water temperatures, but we also find Osedax that, together with endosymbiotic bacteria, feed on the organic material retained in bones and therefore help decompose them," explains Sergi Taboada. According to the researchers, the presence of Osedax at these latitudes could be related to the contact with the deeper and colder waters in Blanes' underwater canyon, an area where they think more abundant and stable populations of the new Osedax species could live. "We need to do more studies to be able to determine if this new species, which we are yet to name, only lives in the shallow waters of the western Mediterranean or if it is also found in other deep water basins in the eastern Mediterranean or Atlantic Ocean, for example," highlights Conxita Àvila. "In this sense, pending the collection of new samples of this new Mediterranean Osedax species to study its morphological characteristics, the only differences that we have been able to determine in relation to other species are genetic," notes Sergi Taboada. Up to now only six species of Osedax have been described, although the existence of more than twenty-five has been determined. These bone-eating worms, described for the first time eleven years ago, have very particular characteristics. The males are microscopic (in the order of 100-500 microns) and live inside tubes built by the females, where they have only a reproductive function. The females, meanwhile, are symbiotic with bacteria, which allows them to degrade the organic matter retained in the bones. They have no mouths or digestive tracts, which is why they feed directly via these bacteria. This way these small organisms (between a few millimetres and a few centimetres in size) help return the organic material stored in bones to the ecosystem. Broadly speaking, part of the female body remains outside the bone, comprising a trunk and head, to which the palps are attached. These are generally a pinkish colour due to the presence of blood vessels. The palps act as gills and it is here where gas exchange takes place. The roots, where the endosymbiotic bacteria are stored, are located within the bone.